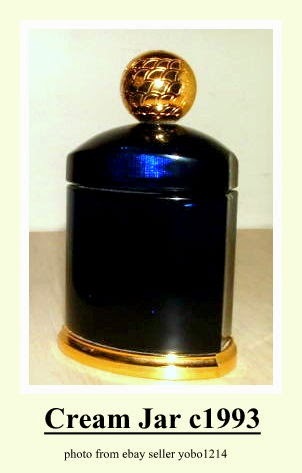 Guerlain Cobalt Vanity Jar and Perfume Atomizer Set exclusive to the Guerlain boutiques. Sold from 1993 til 1999. The glass vanity jars and perfume atomizer were topped with a gilded ball decorated with a stylized scale pattern reminiscent of the Meteorites compact. 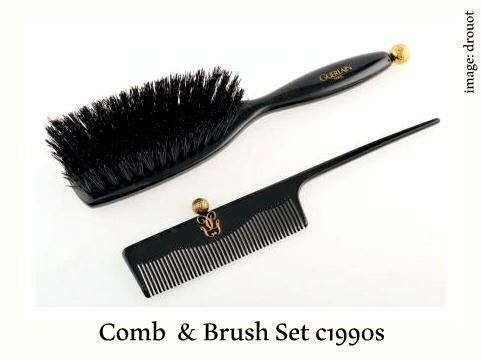 The matching hair brush and comb were also decorated with the ball.